Two North Americans take Irish traditional music into the future by enhancing its distinctive features and making it fresh and contemporary. We live in a global village where traditional cultures from around the world are disappearing at a rapid rate. There are musicians that try to preserve the old ways by recreating it note for note on original instruments as sort of a living library. These artists should be applauded for their conservancy efforts. However, performing music is a dynamic enterprise. One wouldn't want to just consume the products of the past any more than one would want to eat the same dish for dinner every night. Taking past styles to inform new tunes is a tricky business. As a fiddler and composer, Liz Carroll has consistently managed to take traditional Irish music into the present through her creativity and talent. At the age of 18, she won the All-Ireland Senior Fiddle Championship and with piano accordionist Jimmy Keane, won the senior duet championship. More recently she was awarded Ireland's Gradam Ceoil TG4 Cumadóir for composition. While Carroll's parents hailed from the Emerald Isle, she was born in America and has been honored by the National Endowment for the Arts with a National Heritage Fellowship and by Mayor Richard M. Daley with a Liz Carroll Day in Chicago. The fact that one of the world's best Irish musicians comes from the United States is surprising, but in light of internationalization, not shocking. What is astonishing is the fact that Carroll's songwriting and playing continue to improve. 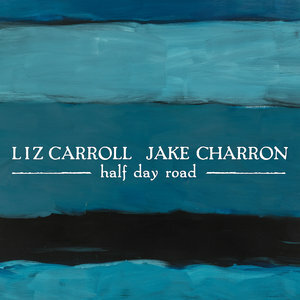 Her latest recording, Half Day Road, a collaboration with Canadian pianist/guitarist Jake Charron, shows her at the peak of her talents. Charron, it should be noted, has also earned many honors including a JUNO Award for Traditional Roots Album of the Year with his band the East Pointers and also nominated for a Canadian Folk Music award for his duo album with Shane Cook called Head to Head. Carroll composed 11 of the 12 pieces on the new album (with Charron contributing an autumnal solo piano piece). The music is mostly carefree, cheerful and energetic. which at first conceals the material's sophistication. When Carroll and Charron tell you to "Fasten Your Seatbelts", they are not kidding. The jig moves at a rapid pace as they expeditiously play in time with each other. The duo also understands the beauty of a slow air. The melancholy piece "The Famine", inspired by stories and images of the Irish famine of the mid-19th century, offers a thicker sound. The music reflects the pain of reflection more than the suffering endured. Carroll lists the stimuli for the individual tracks in the liner notes, which suggests her connection to Irish traditional music comes from people and places. The songs emerge from her interactions with other musicians, dancers, friends, and family or particular happenings at specific locations. The sentiments are often expressed broadly at the beginning of a tune before Carroll and Charron sensitively reveal the rich subtlety of feelings inherent in their instrumental expressions. Consider "Brandan Carroll" as an example. The song is dedicated to a boy who left the world too soon, but Carroll captures his lively spirit more than mourns his passing. Still, the duo offer a tinge of sadness by the restraint in which they perform. The tune is paired with the jauntier "A Tune-Back for Andrea Beaton". Beaton is a Cape Breton composer and fiddler. Carroll's admiration for her peer is clear in the light-hearted nature of the tune. The connection between the two spirits—Brandan and Andrea's—can be found in the articulated delight Carroll communicates in her playing. Half Day Road showcases Carroll's continual growth as a composer and player. Charron does a fine job of accompanying her and offering a counterpart to her work. The two North Americans take Irish traditional music into the future by enhancing its distinctive features and making it fresh and contemporary.